Being independent is the primary need that women have today. While many women are opting to continue working regular jobs beating all odds, some of them opt out due to some or the other reasons. However, for one ones with the will to do more and keep working, here are a few ideas that will help you work from home and earn a good income. Small scale business do not need a heavy investment. There are numerous ventures that will give you opportunities to earn good. Acrylic button manufacturing, agarbatti making, bindi making, blouse hook manufacturing, candle making, chalk making, cotton buds making, lace making and many more such businesses need low-cost equipment, and can be easily mastered in some time. Selling products in a noon-retail environment is referred to as direct selling business. Since they are not available in retail stores, the selling happens in different formats. There are various popular companies that provide us this opportunity are oriflame, amway, vestige, tupperware etc. Data entryyes jobs are available with numerous companies. It is easy to search from them online. Also, what makes these jobs unique is that they can be done by anyone and do not require any special qualification. All you need is a computer and an internet connection. Work project-wise as per your convenience and earn a good amount in no time. There are numerous food products that can be easily produced at home in large quantities. Starting a bakery, making biscuits, groundnut oil production, ice-cream making, lemonade production, pickle making and papad making are some of the many businesses that can be started at home. The new address for all the markets is internet. Selling perfumes, shoes, t-shirts and other products online is an easy task. All you need to do is register yourself as a seller with any online selling platforms and list your products. The next step is the return you will get on the sale of your products. The will to work and be independent by women has made the world a better place. 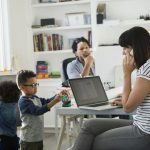 These, and many more options can be considered when it comes to working from home or setting up a small scale business. These jobs are giving women a platform to make it big in the business arena.